Our range of gantry dispensing robots are high power, servo driven, cartesian dispensing robots. The standard range is available with working areas up to 800mm x 600mm, but we can assemble custom sizes up to 7000mm x 7000mm. The versatile UNITOP™ F5200N.1 is a compact and economically priced robot that can be used either as a desktop or a gantry system, allowing users to create their workstation. 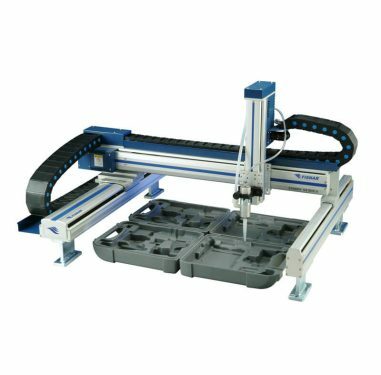 The F5200N.1 is also ideal for conveyor fed automation or installed in work cells operating as a slave robot. The Fisnar F9000 Series gantry dispensing robots are high power, servo driven, gantry and cantilever style cartesian dispensing robots with working areas up to 800mm x 600mm.